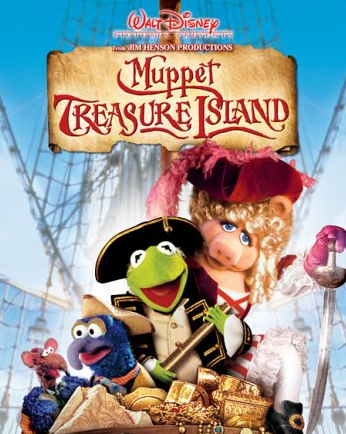 Muppet Treasure Island is a classic movie. Not just for 1990s nostalgia, but as a classic Absurdly Dumb Movie. This movie is so dumb. But it’s so good because of it. Put it up there with Harold and Kumar and South Park. It’s so dumb. But it’s fabulous. The gist: Jim Hawkins is a young man who dreams of adventure. He’s an abandoned orphan, but he still dreams. Ditto for his best friends, Gonzo and Rizzo. They’re best friends. Yes, that’s what kind of movie this is. Anyway, the dudes all work at an inn. One of their regulars is Billy Bones, played with conviction by the excellent Billy Connolly. No one believes his stories of pirates and treasure—until his old pirate buddies come back for his old treasure map. Billy hands the map to Jim and promptly dies. Because this is a Muppet movie, the three friends escape with their lives. Furthering the Muppet movie schtick, they immediately find a ship with a captain that’s willing to take them where they want to go. Loooots of famous Muppet cameos sprinkled in here. But they sail off for the mysterious island with a very suspicious-looking crew. Among them, Long John Silver. He’s a dramatic cook with a talking lobster. He’s also played by Tim Curry. You know some crazy showstoppers are going to go down once they reach that island. What I “learned”: This is becoming the resounding anthem of the 500 Movie Challenge, but it holds especially true here. If a movie has dedicated actors behind it, there’s usually something behind it. If there’s an element of “F*ck it, let’s make a movie,” there’s only so bad the movie can be. Dedication courts greatness. They don’t always run in the same circles, but greatness is much more likely to exist in a space where everyone is dedicated. Tim Curry is working his giant pirate hat like it’s nobody’s business. Kevin Bishop is so innocent as Jim Hawkins, you just want to put him in your pocket. Everyone’s having a great time. So as much as this movie can be cheesy, it’s also incredible. See this movie if you like: Muppet movies in general. This ranks up right there with The Muppet Christmas Carol in dedication to a spectacle. It also has the same level of dedication from the human actions. But while the puppets are just as brilliant, this has none of the drama of Carol. It’s 99 minutes of crazy. Like anteater hand puppets attacking Miss Piggy crazy. Avoid this movie if: You can’t stand cheesy musicals. There’s so much cheese in this movie that you could bring tortilla chips to a viewing and come out with nachos. It’s better than most musicals in that everyone is in on the joke. In fact, I’d recommend it to people who mostly don’t care for musicals. But if they’re already not your thing, this movie may just grate on your brain cells.